It's no mystery why a steakhouse would choose mid-century furnishings to stand above its dark herringbone floors — that's an aesthetic that just seems to work with a rich menu. 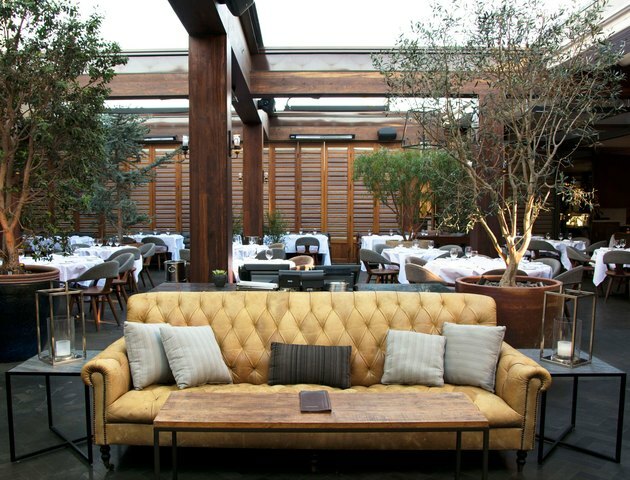 But at Baltaire, an upscale eatery in Los Angeles, the Draper-esque minimalism pulls double duty: it keeps the dark undertones of the space light enough for its Southern California location. "Our goal for the design was to create a modern and stylish setting that redefined the classic American steakhouse, yet still feels comfortable and warm for anyone visiting," said Kevin Khalili, CEO of the restaurant. A mix of seating areas, including a small sitting room with a couple of couches and a fireplace, balance Baltaire's interplay of light and dark with literal sunlight and shade. Walnut and emerald hues in the interior give way to grays and glass in the patio, which is surrounded by a wood accordion wall that can open to the breeze. It's a layout and color palette that's moody without being overbearing, and casual without being superficial. In other words, it's the ideal setting for a feast with any sort of character. 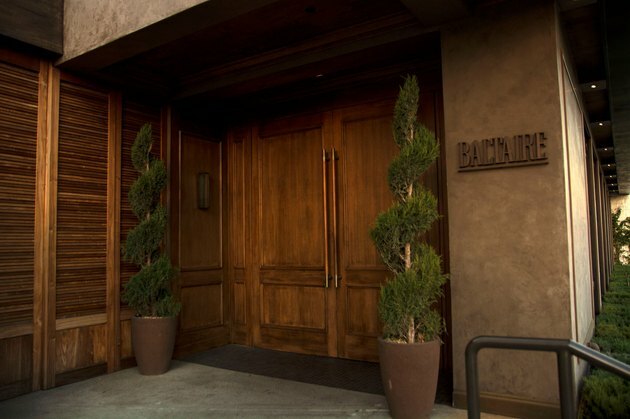 Wood-paneled doors with long brass handles are surrounded by concrete at the entrance. 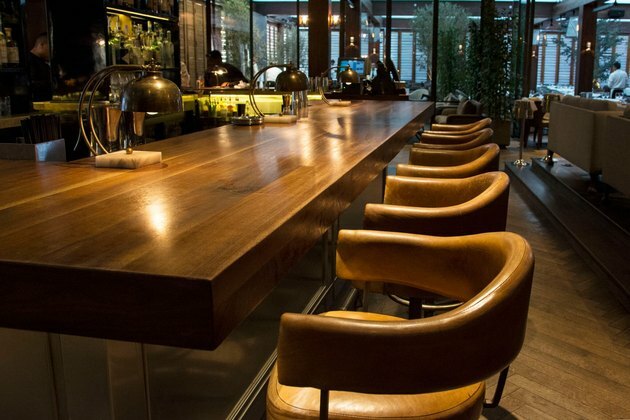 The bar and lounge, with its French oak and dim lighting, epitomizes the classic steakhouse look. Brass-footed chairs are upholstered in a slate grey. 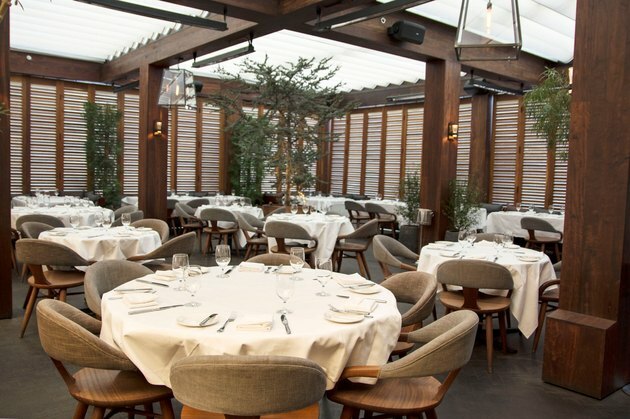 Combined with the natural light from skylights and a retractable roof — plus the verdant citrus trees — the main dining area is airy and bright. 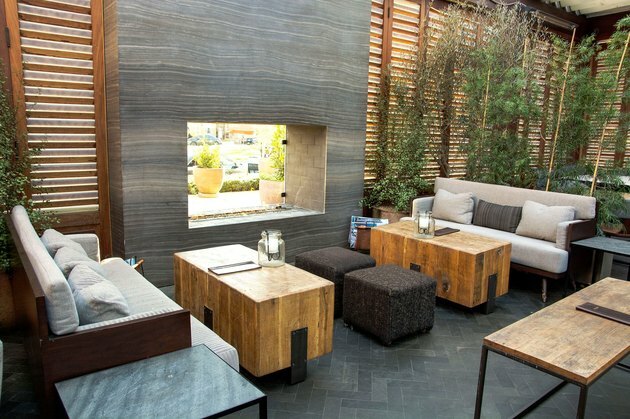 "There's a seamless flow between the terrace and the rest of the restaurant," said Khalili. The stunning golden leather couch adds color to the muted setting. "We added fireplaces and couches to make Baltaire feel like a home," said Khalili.